Above: Via a hot tip from my colleague Kindra Murphy, an amazing poster announcing this upcoming show. 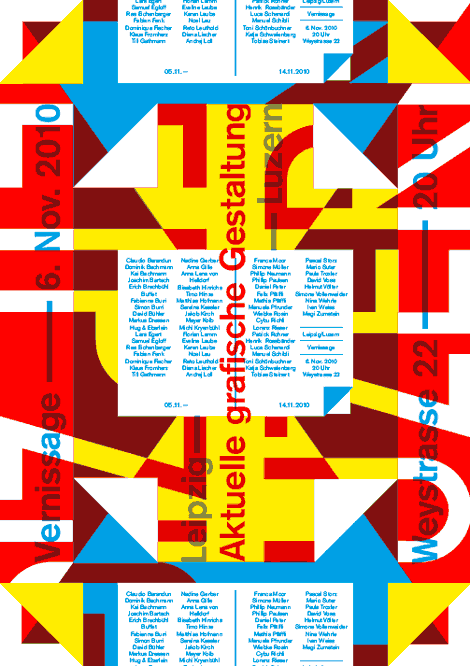 The exhibition celebrates the burgeoning design scenes in Leipzig and Luzern. Let’s hope for more details soon. Make sure to revisit the Südpol work reported here earlier, our man Erich Brechbühl in the house, yo. Previous: John Malinoski / Our Man in Montreal. Totally agree, Tousue. Am grateful to Kindra for sharing this, I may have found my people! This entry was posted by Erik Brandt on Friday, October 29th, 2010 at 10:41 AM	and is filed under Aktuell, Education, Geotypografika, Globalization, Graphic Design, International, Internet, Typografika, Typography.